Efter att vi hade blivit bordade på internationellt vatten av den israeliska militären, övermannats, misshandlade och tvingats till Israel, rånade på fartyg, last samt privata tillhörigheter under vapenhot och förda till fängelset Givon, blev jag samt några kollegor anklagade av den israeliska rättvisan för att illegalt försökt ta oss in i Israel. Låter det absurt? Visst är det det, men glöm inte att Israel är en stat där de har en egen definition av rättvisa, och som vi skall se, där advokaten för inrikesministeriet inte drar sig för att ljuga. Nedan är en översättning av det andra protokollet, sedan följer några kommentarer och efter det är protokollet i orginal, på hebreiska. The prisoner: I am represented by the lawyer Gaby Lasky. Due to the statement by the prisoner, I delay the hearing in his case until tomorrow, Wednesday August 1st 2018, at 12:30. Meanwhile I allow the order of custody in his case. The prisoner will inform his representative of my decision. If the representative does not present at the appointed time, the hearing will be held without her. The secretary will inform the ministry of interior of my decision. This decision can be appealed to the district court in an administrative session within 45 days. Representative of the prisoners: The prisoner never intended to enter Israel. He was not even in Israeli territorial water, but in international waters. Once the Israeli authorities boarded the boat and detained those on it, they were the ones who brought the boat to the port of Ashdod and they were the ones who brought the prisoner into Israeli territory. Therefore arguing that he entered Israel illegally is questionable, considering that it was the authority itself that brought him in. If he is in Israel illegally, either the authority had no right to bring him in or since it was the authority itself who brought him in, he is in Israel legally. In addition to that it must be said that he is in Israel against his will. Moreover, the boat was closer to Egypt than it was to Israel when it was boarded. 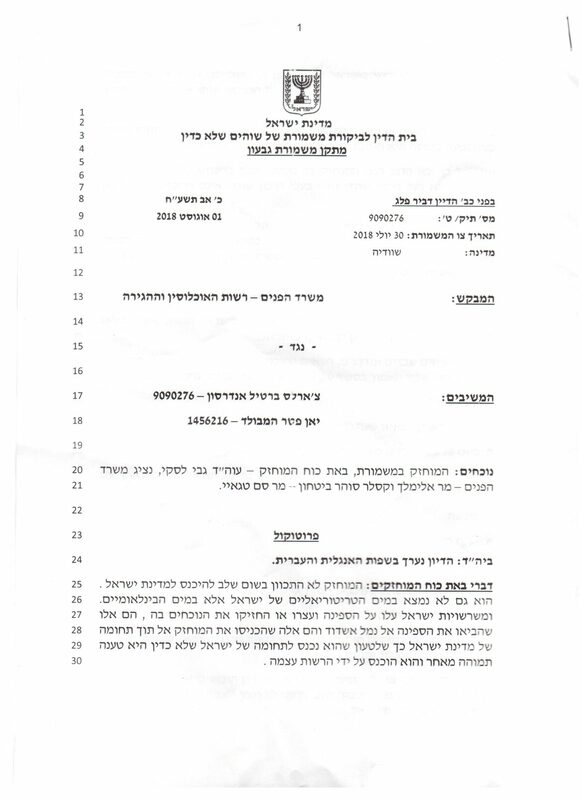 The prisoner was not shown any document advising him that he was not allowed to enter or to be in Israel. He holds a Swedish passport and as such does not require visa before entering Israel. 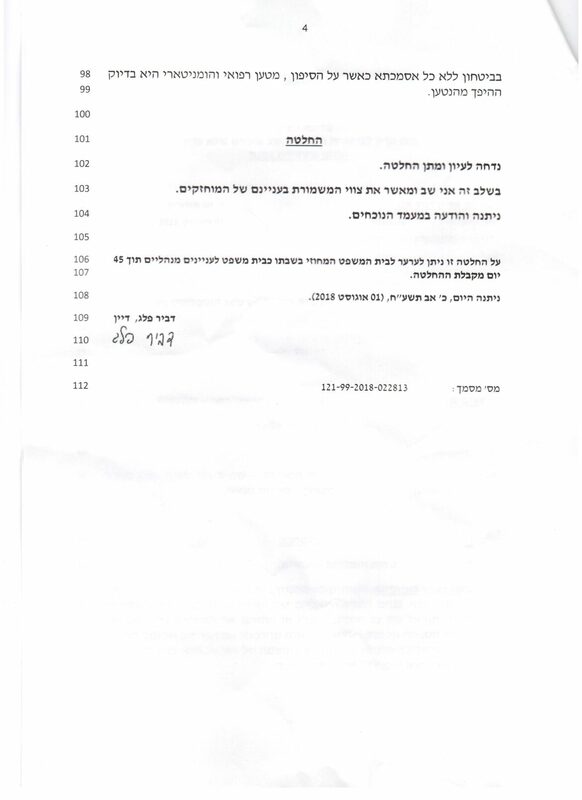 If the Ministry of Interior now claims that Swedish passport holder who enter Israel by invitation or action of the authority are illegal aliens, this may result in a diplomatic problem of the ministry without prior notice changes the requirement that has to do with the relation between the two countries regarding the need for an entry visa. The same goes to those prisoners who are Norwegian citizens. 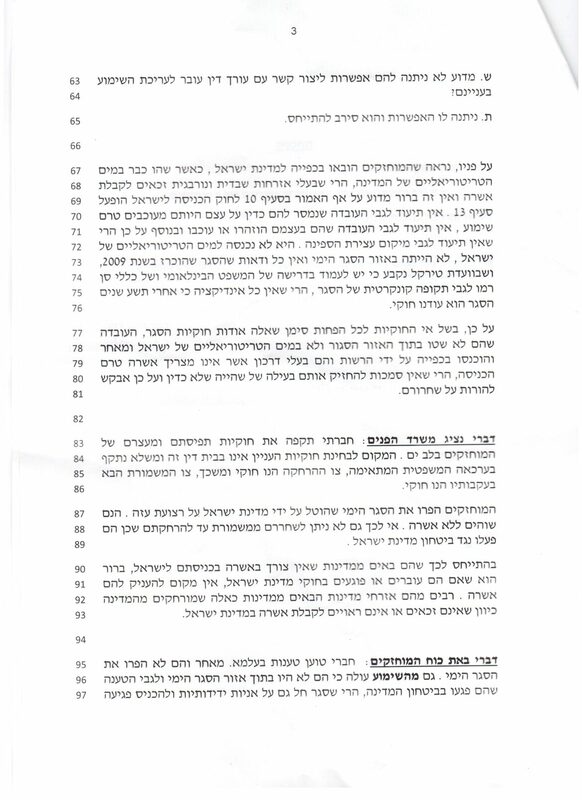 Article 10 in the law of entry into Israel states that those who arrive in Israel and are not allowed to enter, the minister of the interior has the authority to expel them. Swedish and Norwegian citizens are allowed to enter Israel and receive the visa thereafter. Therefore article 10 does not permit the minister of interior to expel them. Q: What were the date and the hour of the hearing? A: The date was July 30, 2018 I do not know the hour. Q: Was the hearing held in Israeli territorial water or only when they arrived on land? Q: Was there a representative of the ministry of interior on the boat? Q: When were they told they were detained in order to hold a hearing? Q: According to the hearing, the prisoners were held in temporary custody prior to the hearing. Who informed them that this was temporary custody? A: They were detained by the IDF on the boat they sailed when it was captured. They were brought into Israel and then they were met by a representative of the ministry of interior. The representative explained to them that their case was checked to see if an order for custody and expulsion can be issued. Q: Why were they not allowed to contact a lawyer before the hearing of their case? A: He was given the option and refused to respond to it. It seems that the prisoners were brought to the state of Israel against their will. Once they were in Israeli territorial water as Swedish and Norwegian citizens they are entitled to an entry visa and it is not clear why despite what is said in article 10 to the law of entry into Israel, article 13 was enacted. There is no documentation of them being duly informed about being detained before the hearing, no documentation of the warning or the detention and no documentation of the place where the boat was stopped. 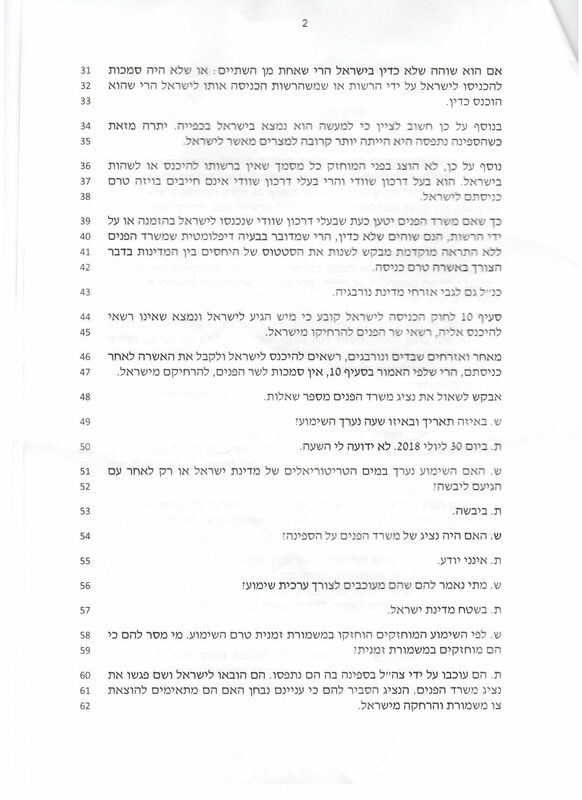 It was not in Israeli territorial water, nor has it entered the naval closure zone and there is no certainty that the closure announced in 2009, which the Turkel commission dictated has to comply with international law and the San Remo Manual regarding a concrete period for its application, is legal, having no indication after nine years that such concrete period exists. Therefore, because of the illegality or at the very least the doubt about the legality of the closure, the fact that they were no sailing in the closure zone nor in Israel territorial water and as they were brought in by the authority against their will and holding a passport that does not require entry visa, there is no right to hold them as illegal aliens and I request that they will be set free. Representative of the Ministry of interior: My colleague attacks the legality of the capture and detention of the prisoners at high seas. The place to look into such questions is not in this court, and since it was not questioned in the proper legal procedure, the order of expulsion and the order of detention that followed it are legal. The prisoners broke the naval closure imposed on the Gaza Strip by the state of Israel. They are in the country without a permit. Therefore they can not be set free until they are expelled because they acted against the security of the state of Israel. In regard to the fact that they come from countries that do not require entry visa into Israel, it is clear that if they act in a way that is contrary or damaging to the laws of Israel, they will not be give an entry permit. Many citizens come from such countries and are expelled because they are not entitled or worthy of receiving a permit in the state of Israel. Representative of the prisoners: My colleague claims are not founded, as they have not broken the naval closure. Even from the hearing it is clear that they were not in the naval closure zone and regarding the claim that they threatened the security of the state, the closure is in effect also for friendly vessels and speaking about a threat to security without any evidence when on board there is medical and humanitarian cargo is exactly the opposite of the claim. Delayed for study and final decision. Meanwhile the custody is allowed. Given and announced to those present. This decision can be appealed before the district court in an administrative session within 45 days. Ovan kan vi ta del av vad representanten för inrikesministeriet svarar på frågan varför jag inte tillåtits kontakta advokat, att jag blivit erbjuden den möjligheten men valt att inte svara. Det är lögn. Tvärtom, under den första utfrågningen krävde jag att få kontakta advokat och blev hänvisad till fångvaktarna som skulle se till att jag kunde göra just detta. Om inte advokaten skulle dyka upp skulle jag tvingas klara mig utan, det var spelreglerna. Men fast jag tre gånger krävde av fångvaktarna att få använda telefon för just detta ändamål förnekades jag denna rätt. Lyckligtvis hade min advokat Gaby Lasky genom sina kanaler tagit reda på dag och tid för den andra utfrågningen. En annan mycket intresssant del är att lagligheten i blockaden ifrågosattes. Enlig San Remo-protokollet skall en blockad, upprätthållen av en främmande stat, vara tidsbestämnd. Så är inte fallet med blockaden av Gaza. Nästa uppenbara lögn av inrikesministeriets representant var att vi hade brutit sjöblockade av Gaza, vilket vi redan har kunnat konstatera saknar laglig grund, fast vi befann oss drygt 40 sjömil från land, alltså långt ut på internationellt vatten. Men som sagt, att ifrågasätta om Israel verkligen är en rättstat är berättigat. Det går att kommentera innehållet i det här protokollet ytterligare, men jag lämnar det till er att läsa igenom det och bara förundras.